Are you an established company uncertain about how email marketing and ecommerce fit into your existing marketing process? Have you been chugging along for decades without either, and think maybe it’s too late to get started? In this case study, we’ll discover how a 20-year old seasonal Christmas attraction launched a new email marketing and ecommerce campaign for the first time ever, increasing their list from zero to over 7,000 subscribers in just one month. Christmas Lite Show is west Michigan’s largest, animated, drive-thru light show. They have been dazzling viewers for over 20 years. Despite their huge base of loyal guests, email marketing and ecommerce were not a part of how they attracted or retained guests year after year. All sales were made in person at the venue as guests showed up to see the lights. Avalanche Creative is a digital marketing agency that focuses on increasing conversions. Christmas Lite Show hired them to design and execute a strategy for their new email marketing and ecommerce campaign. Avalanche shared with us the amazing results, and exactly how they did it. They started by redesigning the Show’s website using Shopify with email marketing and ecommerce in mind. They also created an irresistible coupon offered only on the website: $2 off admission. Once on the site, visitors would be prompted to share their email address in order to receive the coupon. Christmas Lite Show had a lofty goal of collecting 5000 emails. They knew they’d need OptinMonster to achieve that goal. Christmas Lite Show used just two optins to collect subscribers during the holiday season. Both optins presented the same exact offer, a $2 off admission coupon. The first optin was a lightbox optin triggered by a MonsterLink. A MonsterLink is a text link, button or image that, when clicked, launches a popup. They can be used within the content of a page or blog post, or as the primary call to action on a landing page. The show’s homepage was designed around a MonsterLink. After clicking the red button “Get It Now,” the reader sees an optin form promising to deliver the coupon code if they’ll only share their email address. This single MonsterLink converted 70.80% of site visitors! That’s an amazing conversion rate all by itself, but Avalanche Creative wanted to make sure their client grabbed every last email possible. They wanted to make sure readers who didn’t click the MonsterLink still had a chance to get the coupon. To do that, they showed a lightbox popup to every reader leaving the site using our patented Exit-Intent technology. 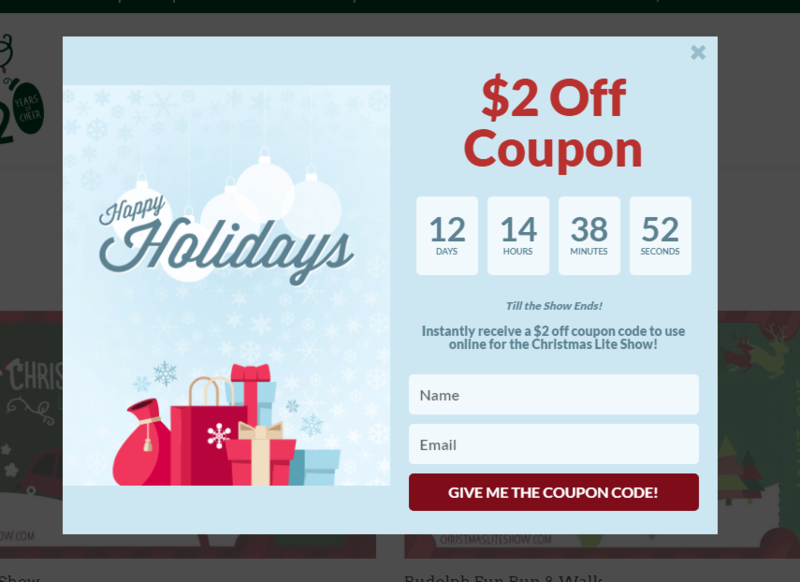 They used one of OptinMonster’s pre-built holiday templates, just changing up the text to feature their coupon offer. The exit-intent lightbox converted 16.49% of abandoning visitors. Other OptinMonster customers have had great success converting abandoning visitors with an exit-intent optin, too. Scott Wyden Photography converted 21% of abandoning vistors to his photograph site doing the same thing. Digital Marketer converted 15% of abandoning visitors into paying customers. Email marketing and ecommerce are a perfect fit using OptinMonster. During the four week period tickets were sold online, nearly 30% of site visitors either purchased a ticket, or subscribed for the coupon. Because of their hard work and planning, Christmas Lite Show now has a huge email list of interested buyers and customers they can market to year after year. Christmas Lite Show smashed their goal of 5,000 emails. They collected over 7,000 customer emails in just one month! Christmas Lite Show recovered 16.49% of abandoning visitors with an exit-intent optin. Christmas Lite Show converted 70.80% of visitors to the homepage with a MonsterLink. Christmas Lite Show generated either a sale or a lead from over 30% of the site visitors. Traditional marketing strategies like offering a coupon can be easily moved online to help drive subscriptions and conversions. Even if you’re starting with nothing, email marketing and ecommerce are worth the effort. The lifetime value of the customer emails you’ll collect will deliver some of the highest return on investment in your business. OptinMonster is the perfect piece of software for increasing overall conversion rates on our client sites. We wouldn’t recommend any other platform. It’s simple, easy to learn, and helps you put your website to work for you, which is invaluable. I don’t think we pay OptinMonster enough.